To locate your nearest participating Caltex, visit www.caltex.co.za or the Standard Bank mobile app. You will collect rewards points for every litre of fuel you purchase at Caltex. You will collect more rewards points by using your Credit Card. To qualify for tier 5 you will need to have 875 or more tiering points AND spend a minimum of R20 000 per fixed cycle on your Standard Bank Credit Card. The qualifying criteria shown for Tier 5 does not apply to Wealth and Investment World, World Elite and World Elite Metal MasterCard credit card clients. Please refer all queries to your Relationship Manager. You can redeem your rewards points for fuel only with your activated UCount Rewards Card. 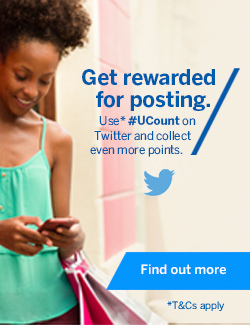 Simply swipe your activated UCount Rewards Card and enter your PIN. If you don't have enough rewards points to pay for your fuel purchase in full, you can use your Standard Bank Credit, Cheque or Debit Card to pay the difference. Your rewards points cannot be refunded back into your UCount Rewards Card once your payment for fuel purchases has been processed. Caltex refund policy will apply. NOTE: You must activate your UCount Rewards Card before you can redeem your rewards points at Caltex. If you haven't yet activated your UCount Rewards Card, you can do this online, or by calling the UCount Rewards contact centre on 0860 UCOUNT (82 68 68). Fuel paid for with your personal garage card, corporate or fleet cards are excluded from collecting fuel rewards points. All purchases, including fuel purchases made in Caltex convenience stores are excluded from collecting fuel rewards points.